TheSandTrap.com’s reviewer, Danny Ottman, put the finishing touches on his thorough review of the Model BG-1 Complete Package and posted it on June 19, 2013. “I’m thrilled that you discovered that what you thought was your preferred hosel design turned out to not be the one that works best for you. That’s exactly the essence of this system. In early prototyping, I met with a golf magazine editor who, after putting with all three designs, commented that he didn’t know why, but he could putt much better with one than the others. Cool stuff. 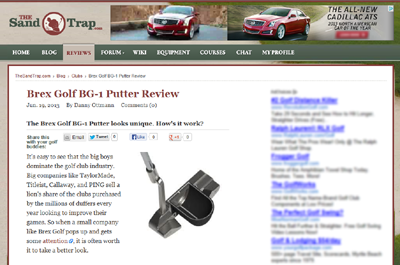 Read The Sand Trap’s complete review.